Celebrating the fun and excitement of movies, sports or music and paying homage to larger-than-life icons, Disney's All-Star Resorts will delight the young and young at heart. 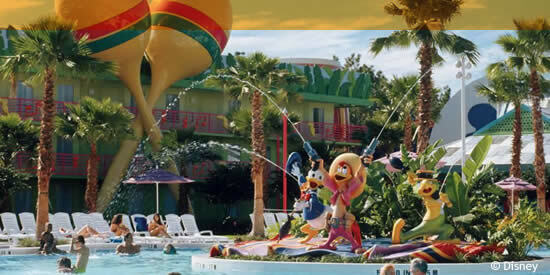 Whether you are fond of sports, movies or music, Disney's All-Star Resorts offer a theme for everyone. Located near Disney's Animal Kingdom® Theme Park and ESPN Wide World of Sports Complex, Disney's All-Star Resorts are family-friendly hotels with some of the lowest rates year-round of any Disney resort hotel. The lower price tag does not mean one has to sacrifice any of your usual comforts. Staying at these resorts, you will enjoy a host of fine amenities and the exact same benefits you will enjoy at other Disney Resorts, which include free transportation across the Walt Disney World ® property and to-and-from the Orlando International Airport, free package delivery to your hotel room and even Extra Magic Hours in the four Walt Disney World ® Theme Parks! 1801 West Buena Vista Dr.
Disney's All-Star Music is a is a Disney value resort that celebrates the love of music. Comprising of 1,604-rooms, with 214 family suite, Disney's All-Star Movies Resort's is divided up into five pairs of three-story buildings, each with it's own theme that pays homage to a certain music genre – Broadway, Calypso, Country Fair, Jazz Inn and Rock Inn. Disney's All-Star Music Resort are decked out with huge saxophones, giant colorful guitars and drums, giant pair of cowboy boots, and streaming sheets of music along the surrounding balconies. The colorful theme of this resort and all of the other Value Resorts, are what have made these hotels so popular with families since their opening in November of 1994. Disney's All-Star Sports Resort is a 1,920-room hotel featuring giant icons that celebrate the fun of sports. Disney's All-Star Sports Resort is decked out to the nines with sports icons – and by that, we mean courtyards that replicate football fields with giant Xs and Os on the yard lines, 30-foot tall tennis rackets and Louisville slugger baseball bats, and stairways that are encased in a gigantic football! 1901 West Buena Vista Dr.
Disney's All-Star Movies is a 1,920-room hotel featuring giant icons that salute classic Disney films. Disney's All-Star Movies Resort brings the silver screen of Hollywood right into the heart of Central Florida. With over 1,900 rooms scattered across the property in separate three-story movie-themed buildings, the stories of these films are re-created before your very eyes. Giant statues of your favorite Disney characters, running film strip balconies, and other classic movie icons adorn the property, adding to the overall Hollywood glamour of the hotel. With Disney's All-Star Movies Resort's consistently great pricing, you can stay within the glistening lights and charm of Hollywood without the hefty price tag. As one of the Value Resorts, this hotel is a great deal with its fairly priced rates and comfortable accommodations. Within the Disney's Animal Kingdom Resort Area, at the northwest quadrant of World Drive and Highway 192 interchange. Lounges, pool side snack bars and pizza delivery service. Note: Food courts offer breakfast, lunch, dinner and snacks.